Long time ago I bought a book with recipes from Pakistan. I cooked quite some of the food from that little book. 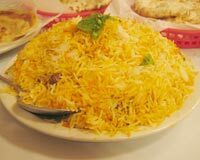 One of my favourite dishes (my wife loves it too) is biryani. So, when I had to make up a meal for this weekend, I decided I would do a biryani again. Being too lazy to get up and search for the book, I used Google to find some inspiration. And the first hit was an interesting variation to the Pakistani version I cooked so often. No eggs, no tomatoes, no raisins. I made some alterations to the original recipe, mostly caused by the (un)availability of ingredients at the local shop. The recipe is not difficult at all. I think you can not fail to produce something that you’ll like! Preparing the marinade takes a bit of time, then you can turn your attention to other things for at least two hours while the meat is marinating. The actual cooking takes 20 minutes. The moment all the ingredients went into the cooking pot, my wife commented that the aromas were heavenly! She walked over a couple of times to lift the lid and enjoy the scent of the boiling goodness. 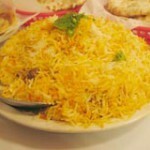 The resulting dish is an aromatic and rich comfort food. You will keep eating until your belly protests. Melt 100 g of butter (you will not use all of it in the biryani, so you can store some of it for later). Keep the heat low, do not let the butter turn brown! Let the watery component of the butter boil away for some 10 to 20 minutes. From time to time use a spoon to remove the foamy substance which forms on the surface. When no new foam is forming on the surface, the ghee is ready. It will have a golden colour. We need to get rid of the brown residue on the bottom of the pan. Pour the ghee through a clot or simply use a tea restrainer or other finely meshed sieve. You can store the ghee in the fridge if you prepare this long before the actual meal. Grind the garlic and the ginger. Mix this thoroughly through the chopped meat. Put the marinade in the fridge for an hour. In the meanwhile, fry the sliced onions in a heated pan on low heat untill they turn light brown. Let the onions cool down and crush them (or chop them into fine pieces). After at least one hour, retrieve the marinating meat. Add the fried onion, lemon curd, lime juice, red chilli powder, green chilli paste, cinnamon, cardamom, caraway seeds, clove, coriander leaves, mint leaves and salt to the marinated meat. Mix thoroughly and place the meat back into the fridge for at least 1 hour. Drop the saffron in some water to extract its color and aroma. Or if you do not have saffron, use plenty of turmeric in the next step. Boil 1/2 liter of water. Add salt to taste, cinnamon, cardamom, and the saffron water. Use an iron cooking pot with thick bottom to prevent the rice from burning. Heat a bit of vegetable oil in the pan. Add half the rice and fry for a few minutes. Keep the heat low. Pour the ghee over the rice. Spread the marinated meat on top, and again spread the remaining semi-cooked rice over the meat. Gently pour the boiling water in a circular motion over the rice layer. Keep boiling on a low flame for exactly 15 minutes. Ready! The water should have been absorbed by the rice. Ideally this biryani is served with some Indian cooked vegetables… but I thought of my son and served broccoli instead. Posted: 6 February, 2012 in Me, Recipes. My friend used to make this. He’s from Hyderabad too. You can also use Biryani masala (it comes in a packet, can be bought from some Pak/Indian food store) instead of all herbs and powdered chillies.